As users upload video to your MediaSpace environment, they will be able to request captions from the Edit page of any video once it has been transcoded and is ready to view. 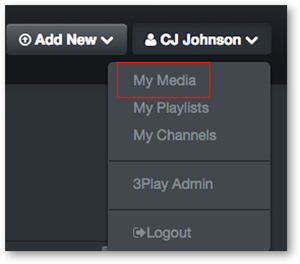 To upload media, click Add New located in the top right corner of the page. From there you can upload videos on your computer, via Media Upload . You can also create a Webcam Recording and a Screen Recording. Once your video is available in MediaSpace after upload, captions can then be requested for this asset.